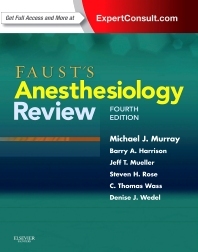 Quickly expand your knowledge base and master your residency with Faust's Anesthesiology Review, the world’s best-selling review book in anesthesiology. Combining comprehensive coverage with an easy-to-use format, this newly updated medical reference book is designed to efficiently equip you with the latest advances, procedures, guidelines, and protocols. It’s the perfect refresher on every major aspect of anesthesia. Take advantage of concise coverage of a broad variety of timely topics in anesthesia.